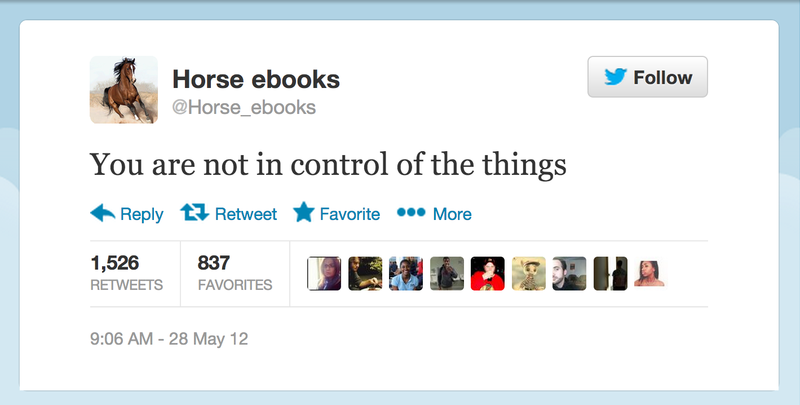 I keep asking people, "So did you hear about horse_ebooks?" 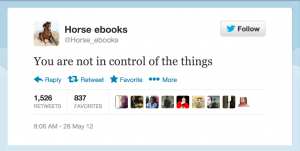 But while my Twitter feed went a little crazy this week, people in real life had no idea what @horse_ebooks was or why a spambot reveal mattered. And I don't know why either! But I still have these totally weird wistful feelings about the whole thing. Sigh. Here are some semi-hi-res commemorative tweet screenshots. Click through and hang them sadly on your office bulletin board, if you want.